If you have made the move to Microsoft Office 365 or plan to, you will reap the cloud benefits of ubiquitous data access and overall agility, as well as the ability to shift certain capital expenses to operational expenses. That’s the good news. The bad news is that in moving email to this versatile cloud environment, organizations may well be exposing themselves to a wide range of security risks, data loss, and business continuity issues. 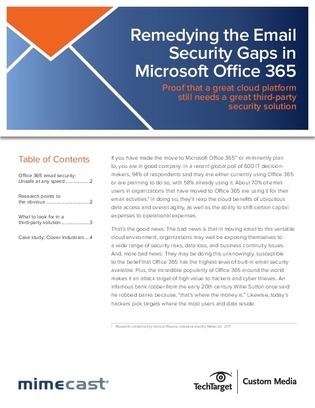 Plus, the incredible popularity of Office 365 around the world makes it an attack target of high value to hackers and cyber thieves. Download this white paper to learn what to look for in a third-party security platform today.